Ready to start a NEW Easter tradition this year? I feel strongly that kids need to learn that there's more to Easter than bunnies, baskets, and jellybeans. But Easter can be tricky. The story of Easter centers around a Death & Resurrection- which are challenging concepts to present to children at an age-appropriate level. I struggled for many years trying to figure out the best way to introduce children to the story of Jesus' death and resurrection. I wanted them to know the TRUTH, but I certainly did NOT want parents telling me "Easter Nightmares" kept their children awake at night. So for the past 12 years, I've done something a big DIFFERENT with the kids on Easter. We put on an Easter Pageant! It's true! And we allow ALL the kids to participate, not just a "select group". And the best news- you can do the same thing this year! These are my two all-time favorite pageants that I’ve ever done at my church. They are 100% original and they will work for churches of any size! "He is Risen" is a modern adaptation on the classic story of Jesus' death and resurrection. While most Easter stories deal with the crucifixion and the events preceding it, very little has been written about the time period between Christ’s death on Friday and His resurrection on Sunday. This program features this portion of the Easter story. The celebration of Easter becomes an even greater triumph after understanding the disappointment and grief people suffered during the weekend time period. In "Internet Easter" the emcees are shocked when “Mr. Know It” informs them that Easter bunnies, decorated eggs, and jelly beans are not mentioned in the Bible. Confused and curious, they call upon Maggie, “The Internet Whiz Kid”, to help them figure out what eggs and bunnies have to do with Easter. With a little “detective work”, Maggie is able to explain What really happened when Jesus died on the cross and rose again. Scripts can be reproduced as many times as needed at no extra charge (use it year after year if you like). Includes easy-to-use- lyric sheets you can hand out to performers. Nearly everything can be easily found in any family house! No big shopping trips required. We tell you exactly what to do with each age group so that the little ones have roles that are appropriate. Easy and affordable ideas to have your performers looking great! 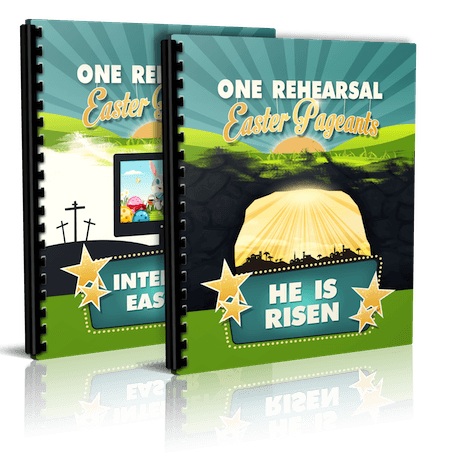 In other words, with this package you get all the components you could possibly need to make this year’s Easter pageant fast and simple to stage, fun to perform and wildly entertaining to watch! So, instead of a NEW script this year, I've bundled up my two favorite Easter Pageant Scripts from years past and I'm going to give them away at as a "Package Deal" at a blockbuster price. Last year, each of these scripts sold for $19.99. But this year, I want to encourage some of my customers who have had a severe "Easter Pageant Phobia" and give everyone an offer that's hard to pass up. So this week, you can get BOTH scripts, for just $9. Yep, that's only $4.50 each. I know, I'm crazy. You see, I really don't see these scripts so much as "money makers", but more "memory makers". My children have such positive memories associated with being a part of the Pageants, I want to share that feeling with as many kids as possible. And I hope this pricing allows everyone who WANTS to put on a Easter Pageant the ability to DO IT. So...You have no excuse now! Go For it! 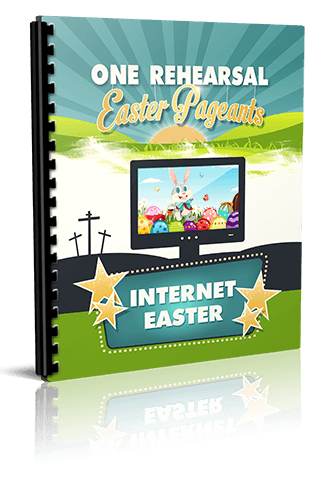 That’s right, we are so sure that you will love the Easter Pageant Pack that we are offering an unconditional 100% money-back guarantee. That’s TWO FULL MONTHS to put these fun turn-key pageants to the test! Easter Pageants that I can use over & over again. 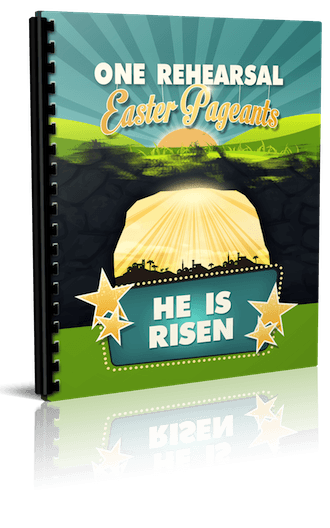 Our Easter Pageants are geared for kids ages 3-18, we know that churches of all sizes & various age groups have successfully used our pageant scripts. Do You Pageants Cater to A Specific Denomination? Our pageants can be used by churches of all denominations, as the topics covered are truly basic to the Christian faith.